All life-long obsessions have to start somewhere. Mine? Seeing a two-foot nine James Bond use a three-foot villain named Mr Giant as a punching bag. The film was For Y'ur Height Only, and the miniature Bond was played by midget superstar Weng Weng. I was one of those Betamax Generation kids who grew up in video stores in the Middle East. No Star Wars and Indiana Jones for me, though. Instead it was a steady diet of bottom of the barrel treats: Zombie Flesheaters, biker films, Humanoids From The Deep. "Good" films came later. 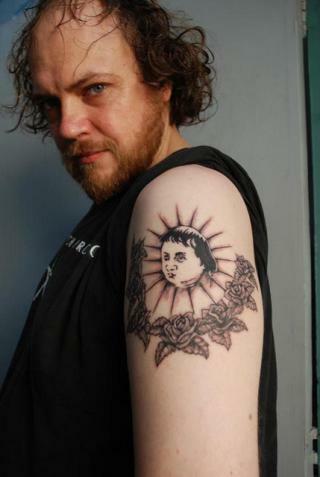 A Clockwork Orange, Easy Rider, El Topo. I preferred "outsider" cinema because - well, I was one weird little kid. After college, I opened my dream video rental store full of the craziest films I could find. "Trash Video" was an endless voyage of discovery as I discovered even more titles from the Philippines. Cirio Santiago, Bobby A. Suarez and Eddie Romero became my new Kings of the Drive-In. I fried my brain on Cirio's Mad Max ripoffs, Bobby's Cleopatra Wong series. These killers from Manila seemed to occupy a parallel film universe to the one I was used to, a perpetual loop of kung fu kicks, floral shirts, hair helmets and big moustaches, and seemingly baffling twists of logic. I was hooked. It was at Brisbane International Film Festival that things started getting weird. 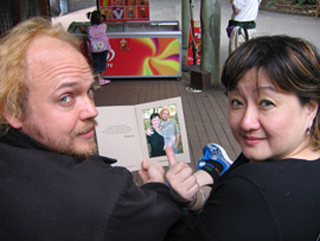 Cleopatra Wong herself, Marrie Lee, flew from Singapore to introduce the screenings I'd programmed. I was wearing my 'I Heart Weng Weng' T shirt when Cinemanila director Tikoy Aguiluz came to my 'Bamboo Gods And Bionic Boys' seminar. "I love Weng Weng too!" he proclaimed. "Come and join me in Manila…"
Next thing I knew, I found myself in a Greenbelt cinema in front of a Cinemanila audience filming them chanting "We love Weng Weng!" I suddenly remembered a dream from ten years before. I was in a Manila hotel room with a camera in one hand a phone in the other, and was saying to the voice on the other end, "My name is Andrew Leavold, I'm a filmmaker from Australia in Manila to make a documentary about Weng Weng." Spooky! 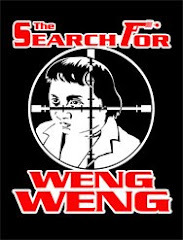 Under such bizarre circumstances my film The Search For Weng Weng had begun, and was already starting to resemble a cheap detective novel as I pieced together Weng Weng's forgotten saga. I stumbled on editor Boy Vinarao outside Mowelfund, and discovered by chance that he had edited all of Weng Weng's films! "What happened to him?" I wanted to know. All he remembered was that Weng Weng may have died. I then tracked down action director, goon and award-winning stuntman Eddie Nicart. Eddie was director on five of Weng Weng's films, and had trained him to become a stuntman. Even he couldn't tell me what happened to him, or remember Weng Weng's real name. The Search For Weng Weng was hitting a brick wall at the end of a blind alley. Such is the relentless nature of popular culture; precious things become lost beneath its ever-shifting sands. Out of the blue, a legman called Rene sent me a text: "I found WW's brother." A day later I'm at the doorway to a modest Pasay dwelling face to face with Celing de la Cruz, his only surviving sibling, and an older and taller replica of Weng Weng. 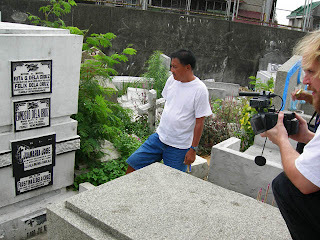 Celing not only gave me Weng Weng's often heartbreaking life story, but also drove me in his jeepney to the home Weng Weng (real name Ernesto) was born in, and guided me to his final resting place in Pasay City Cemetery. I remember placing my hand on Weng Weng's simple concrete tomb and feeling like I'd finally completed a seemingly impossible quest for the Holy Grail - that is, if the Grail was a two foot nine James Bond. Flash forward to 2012: I'm only days away from my eighth visit to Manila, a place I now regard as my second home, where those B film pioneers are now my friends and associates. Griffith University in Brisbane invited me to turn my research into a doctoral thesis on genre filmmaking in the Philippines. I now lecture in Pinoy B films, and this trip will travel the country's university campuses, preaching an alternate history of Philippine Cinema, with Weng Weng as its focal point and avatar. As for The Search For Weng Weng, the project was taken over by Australian TV with me as Associate Producer and mutated into Machete Maidens Unleashed, a broader history of drive-in trash from the Philippines, which has since screened all over the world. I'm certainly proud of Machete…, but my dream project is still in a thousand pieces, and if any equally obsessive producers out there are interested in sharing in my madness, please drop me a line, or I'll see you in class! Australian-born Andrew Leavold is a published author, film festival curator, musician, TV presenter, filmmaker, and above all, unrepentant and voracious fan of eccentric and lowbrow cinema. He will be giving a series of talks in the Philippines at the following venues: June 27: College of Mass Communication, UP Diliman, Quezon City; July 4: University of San Carlos, Cebu; July 5: La Salle, Bacolod City; July 11: College of Mass Communication, UP Diliman, Quezon City; July 13: UP Baguio. He can be reached at andrewleavold@gmail.com. awesome stuff, when I was 17 I read a book that detailed For Your Height Only in the local library. I have been a fan of Weng Weng since. Good work.